With a few more apples to use up (even after making five pints of Apple Cranberry Chutney), I found another worthy recipe that I morphed just a bit. The original recipe is one from Betty Crocker, but I swapped out the butter and added coconut oil. I also added a bit of whole wheat flour and a bit of nutmeg. Heat oven to 375°F. Line a cookie sheet with parchment paper or a silicon pad. In large bowl, beat coconut oil, granulated sugar and brown sugar with electric mixer on medium speed until creamy. Beat in vanilla and eggs, scraping sides occasionally, until blended. In a separate bowl, mix flours, baking soda, cinnamon, nutmeg and salt. Gradually beat flour mixture into creamed mixture. Stir in oats and apple. Using a cookie scoop, drop dough by rounded tablespoonfuls, two inches apart. While cookies bake, make the drizzle. Place powdered sugar, apple cider, butter, brandy and cinnamon in a small heavy saucepan over medium-low heat. Whisk until ingredients are combined and glaze is thick but pourable. Because of the coconut oil, these are a flat cookie so be sure to place your scoops two inches apart or more. The original recipe also had a simple powdered sugar glaze. I swapped in a glaze that was a bit more caramel like for an Autumnal taste explosion! We actually had these for breakfast over the weekend! Now the comment did get through…I love those giant autumnal cookies! Nutmeg is so nice in baked things, isn’t it? Love its aroma and flavor! These are perfect for the season — great way to use apples. And oatmeal! Thanks. Oatmeal makes these a rationalization for breakfast, right? 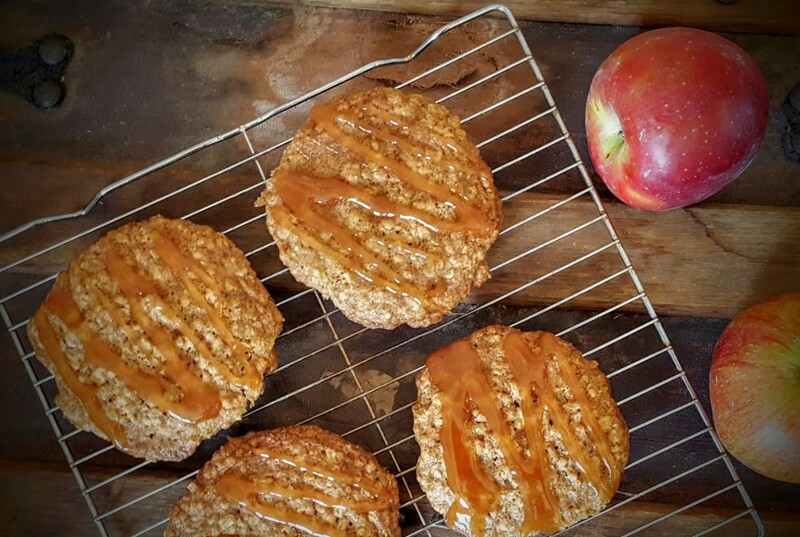 I do like oatmeal cookies but what a great idea to use apples. And I am loving the Brandy caramel drizzle, that sounds delicious! I am wondering how zucchini would work in these (or carrots)???? These cookies are dreamy!!! I’m all about apple desserts in the fall, but I haven’t made cookies yet. These with that boozy drizzle must taste wonderful!!! Thanks, Liz. Working on an apple bread pudding next! 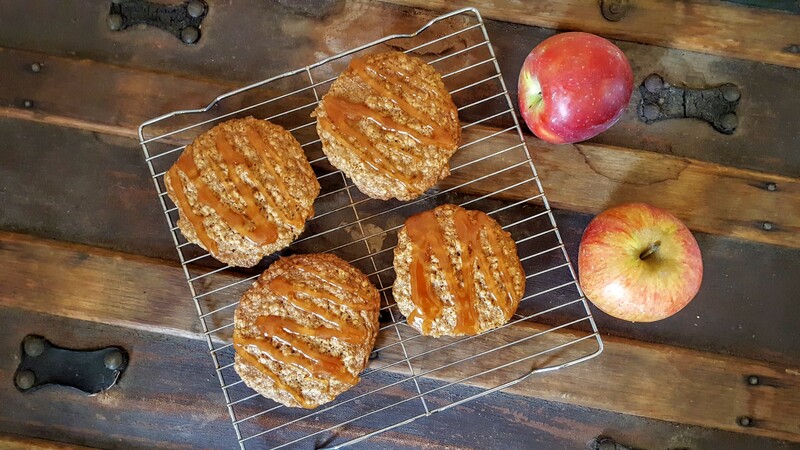 Apple with steel cuts are my favorite, so I can really imagine how delicious these cookies are and then the boozy caramel…well, that just takes them over the top. MMM. That sounds delicious too. Especially at this time of day! These would make a nice gift, with the holidays coming up I think a basket of these bad boys would be very popular. I was thinking about our local holiday cookie recipe contest and entering these.